Green Ribbon Schools, a reward and recognition program for K-12 students, recognized Timmerman Elementary School among 63 schools in 13 states and Guam for achieving the online community’s highest level of participation during the 2011-2012 school year. Stars and Stripes Guam Newspaper features Cmdr. William C. McCool Elementary and Middle School for being one of the 63 schools that received a Green Ribbon Schools Award for the 2011-2012 school year. Cmdr. William C. McCool Elementary and Middle School in Guam learned about a local limestone forest and wetlands by meeting with a scientist, building observation areas and posting their findings in a school hallway dedicated to the project (Jean Tuquero and Elizabeth Atoigue, teachers). They also had a Media Blast of ways to be healthy using their in school closed circuit television news program (Cynthia Barcinas, teacher). The eighth-grade team completed a recycling program (Gina Gonzales, teacher) and students created healthy choice video games to share with other students (Debora Moore, teacher). Green Ribbon Schools is proud to be awarding a Green Ribbon Schools Award to 63 schools for the 2011-2012 school year. 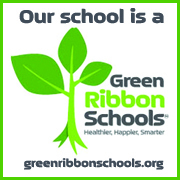 You can view all of the Green Ribbon Schools Award recipients by visiting the participating schools page on greenribbonschools.org. Learn how to earn a Green Ribbon Schools Award for your school by visiting our website.